1. My time was 5 minutes faster than my qualifying Quebec City marathon. 2. My average heart rate was 164 bpm. 3. According to my Polar RCX5, I burned 2,557 kcal. 4. I finished in 2,880 th place, out of 31,931 runners. 5. I swore to myself that I wouldn’t consider any follow-on sporting events for at least one week. 6. I took a leak (ninja style) in the starting corral about 5 minutes for our 10AM start. I didn’t have to pee again until 4:30 PM. I may have been a little dehydrated. 7. My co-worker hosted me at her house in Hopkinton, 1/4 mile from the start. It was a pleasant, relaxed way to start the race and gave me the chance to squeeze in an extra cup of coffee. 8. In Quebec, my quads started to fail with 10 miles to go. In Boston, it was 4 miles. If I were to do a few more marathons, I might make it to the finish, but see point 5. See also next point. 9. 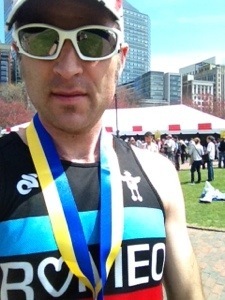 I started training in earnest for Boston only 10 weeks beforehand. I rarely ran more than 3 times/week. I may have been a little undertrained for running (though I had plenty of skiing). 10. The hardest part of the Marathon was going DOWN the stairs into the T-station after the race. From the corner, I could see the finish line and the long long stretch of pavement still to cover. Less than a mile. Just a few more minutes. But it was taking forever. The crowds were the thickest here. And the loudest. Their cheers echoed off the surrounding buildings. Yet I felt I was finishing all alone. I had left the start line in Hopkinton three hours earlier, bobbing along in a sea of runners, buoyed on by the shouts of the crowds and the shrieks of my co-workers. It was incredibly thick at the start. I weaved around my fellow runners, trying to find an early rhythm, nervous about going out too slow. I would never see clear road in front of me the entire race. It took the first 4 miles to find a rhythm. I had memorized my split times. I had written them on my arm in case I forgot. I was on target. So far. I tried to stay relaxed. Run smoothly. Run with calm. It was still cool. Even with the bright sun and clear skies. But the temperatures were expected to climb throughout the day. In Ashland, the crowds were already thick along the side of the road. 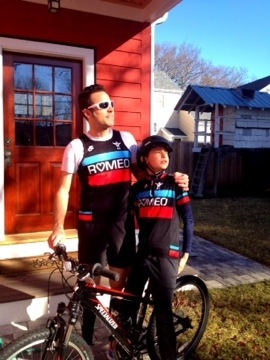 On the first hill, they shouted “Go Romeo!” as I passed by and I started to choke up. I had a long ways to go. 3 hours and 3 minutes. Not the goal. But good enough. The Marathon is almost here. I did one of the last few runs before the race. A short easy run. Nothing to be gained now from training. Just rest and recovery. I felt good. Better than last week. Still some aches and pains in my shins and hips, but nothing that won’t go away after a few miles. I ran along the course where it climbs the Newton hills, where I’ve done so many runs in preparation for this. In the dark and the cold. In the snow and ice. Rain and wind, too. Hard to believe it’s here after all these months. The barricades are up and the daffodils are in bloom. There is an energy in me that is building. There is an energy in the streets. You can feel it already. On Monday, it will be incredible. One week to go until the Boston Marathon. My taper was going great. I cleared the longest run of the progression — 22.5 miles. I had sorted out my shoes — no more blisters. I felt brilliant on the shorter runs. But then the bottom fell out. Last week, my legs were sore and stale. My lower back hurt. I was losing motivation. It continued all week. So I pushed through all the workouts. My right shin hurt. My right side felt like broken ribs. My right hip started causing problems again. I was exhausted. There were other things going on, too. I had allergies that made me feel drained. I was confronting the loss of my son Romeo all over again. I lost a few nights of sleep along the way. The Marathon will be emotional for many reasons. Romeo was due on Marathon Monday, back in 2005. We were worried about how we were going to get to the hospital on the race course. But he came early. And we lost him because of that. The last nine years have been a slow hell. There are the bombings, too. All week on NPR they’ve been reliving the events of last year. And I remember that same sense of helplessness, that search for meaning, that lingering pain. I’ve connected the two events in my mind. So I’m hoping things turn around this week. That I’ll feel fresh and recovered. That I’ll be prepared for the 26.2 miles. That I’ll be ready to run. And I’ll run by Newton-Wellesely Hospital. And I’ll get over Heartbreak Hill. And I’ll finish — hopefully — on Boylston Street.